Sequel to the riot that came up on Friday 9th of November, 2018 at Ondo State House of Assembly Complex, Nigeria Labour Congress fire's back. "We are dismay and worried to communicate to you the dastard act and unfortunate incident at the assembly complex that grossly inflected assaults and immense injury on the staff of the complex. 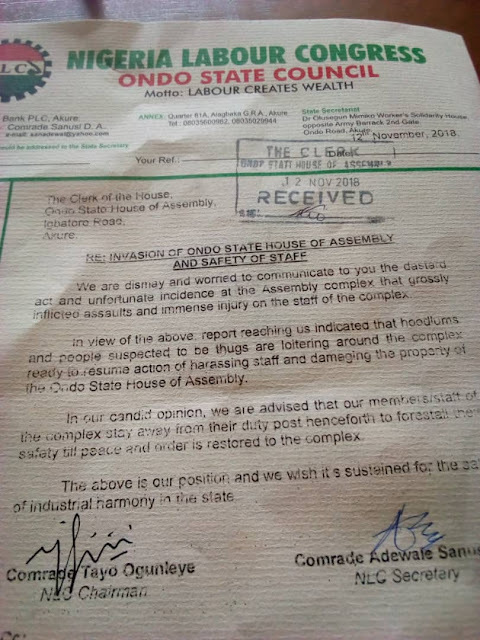 "In view of the above report reaching us that hoodlums and people suspected to be thugs are loitering around the complex ready to resume action of harassing staff and damaging the property of the Ondo State House of Assembly. "In our candid opinion, we are advised that our members/staff of the complex stay away from their duty post henceforth to forestall their safety till peace and order is restored to the complex. "The above is our position and we wish it's sustained for the safety of industrial harmony in the state.